Halloween is just around the corner and there are few holidays that kids love making treats for as much as this one. 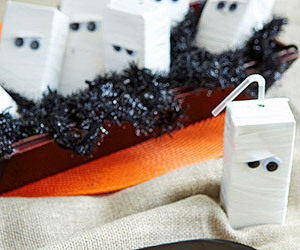 With all the spooky, gross and cute ways to create fun treats for school, all types of kids will find the joy of making spooky ghosts, which hats and spider pizzas to surprise their friends. This one is extremely easy and can be a ton of fun with the kids. Cut bananas in half and stick them onto Popsicle sticks. Melt some white chocolate and dip them into it to the point that the banana is completely covered. Use semi-sweet chocolate chips for eyes and let them freeze overnight. This one is perfect for the gross out factor. 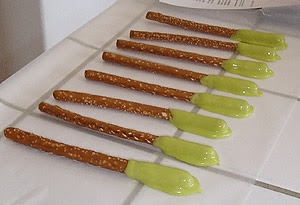 Simply melt some Cheese-Wiz with green food coloring and keep going until you find that perfect booger color. Pour it into a bowl with some pretzel sticks next to it. This is the one time kids should be eating their snot. This one requires very little work and can be a huge heat at any party. Besides, they are also the healthiest treat your kid can gross his friends out with. First peel some carrots and put some cream cheese on the tip where a fingernail would go. This cream cheese will act as glue for slivered almonds which should be shaped like finger nails. Getting ready for a Halloween party couldn’t be much easier, or healthier. This idea requires a few items but no baking. Buy some juice boxes and wrap them with white electrical tape. Make sure the tape gives them the look of a mummy. Get some adhesive googly eyes and pop them on however you like. Make sure you make a little area for the straw to punch through the tape and hole so the kids don’t have to fight with the box to drink it. This one will certainly be a big hit but is probably the most complicated of all of the recipes here. Find a head sized watermelon and start peeling the rind off until just the white part is left on the fruit inside. Do this all the way around the watermelon until you have removed the outer rind completely. Next you’ll use a paring knife and a large knife to start cutting the zig-zags that make the watermelon look like a brain. Because the outside will still be white and the inside will be red, it will give the illusion of a bloody brain just inside of someone’s skull. We already covered carrot based fingers, but these are actually much creepier. 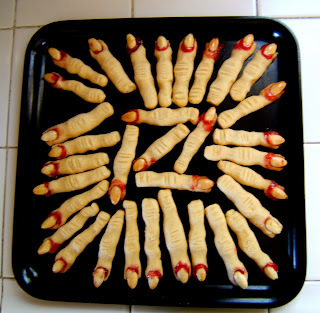 Use something about the width and length of a finger, a pretzel, or celery stick or carrot to form your base. Then wrap some deli meat around it leaving a small opening at the top. Add a slice of almond for a fingernail and the fingers will look as though they are rotting. You can get even more creative with this if you like, so take any of these recipes and let your kids go crazy with ideas. Janice F. is a writer for BestOnlineCollege.org. If you are a stay at home parent, and you want to learn more about earning a degree from home, take a look at this site today! 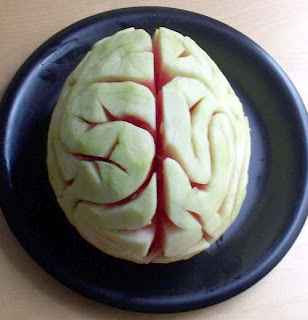 I love these recipes and never would have guessed the brain was a watermelon! I believe the top recipes are more my speed and my kids would love to find those on the table when they came home from school. Ys, they are great for the kids!! Wow! What great ideas - that brain is really cool! You would NEVER guess what it actually is!